Last Fall I found a great tall mirror on clearance at Garden Ridge, and even though I didn't know where it was going, I couldn't pass it up. So, it sat in my bedroom for months, until I spiffed up my little corner in the living room and it found the perfect home. It was silver (not really my color) and plain (not my style), but I planned to fix all of that. First off, I wanted to add some trim just to make it a little more interesting. I found some at Home Depot that was thin enough to cut easily and only cost around $7 for this project. 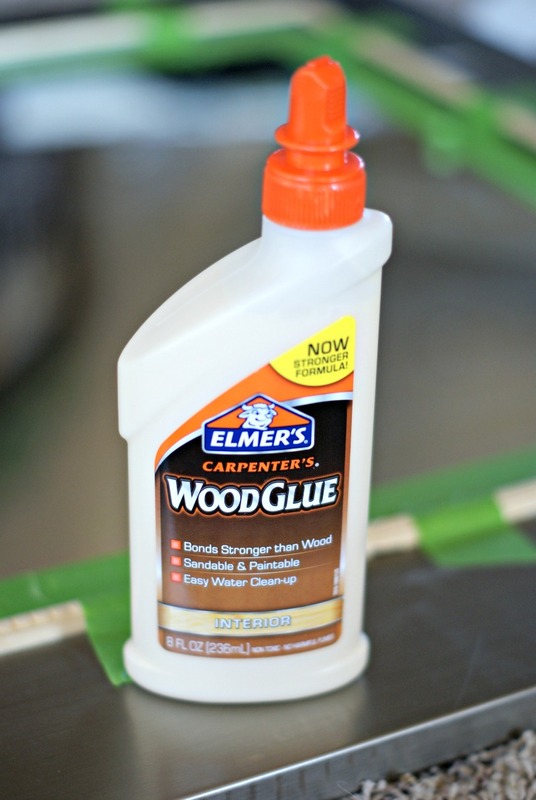 After mitering the corners, I used good 'ol Elmer's wood glue to affix the trim. 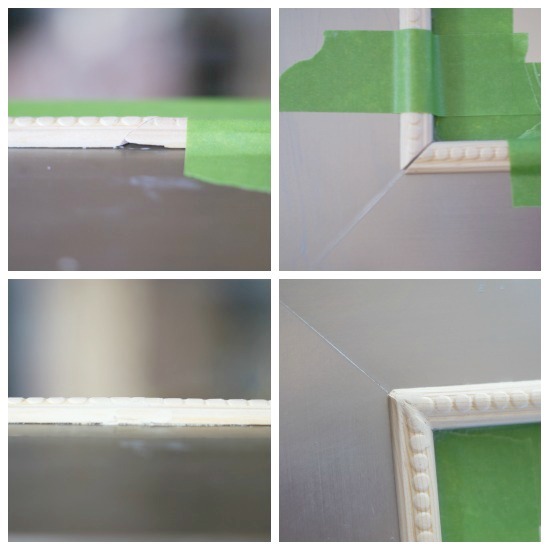 I'm not sure the frame is wood but I know it's very hard and I didn't want to mess with trying to nail the trim on. The trim was so light that the glue worked like a charm. I had a few corners and problem spots that didn't match up exactly, but with a bit of wood filler no one will ever know after it's painted. The frame was a little scratched up (probably the cause for it hitting the clearance rack!) so I filled those in with some wood filler and lightly sanded. The mirror got a coat of gold spray paint-I can't remember if I used Rustoleum's Metallic Brass or Metallic Gold....I go back and forth. As much as I love gold spray paint, sometimes the finish falls a little flat. Also, no matter what "gold" color I tried, it was too bright for the more antique looking gold frames that I was using next to the mirror. After a little more experimenting, the best method I found for this smooth, flat surface turned out to be using a paintbrush to dry brush the paint on. To dry brush, just get a little bit of paint on the ends of the bristles, and then lightly paint on the surface. I applied the paint in random places, and then when the wet paint was gone off of the brush, used it to feather and blend out the dark paint spots. Just keep rubbing with your brush until it looks how you want it to. 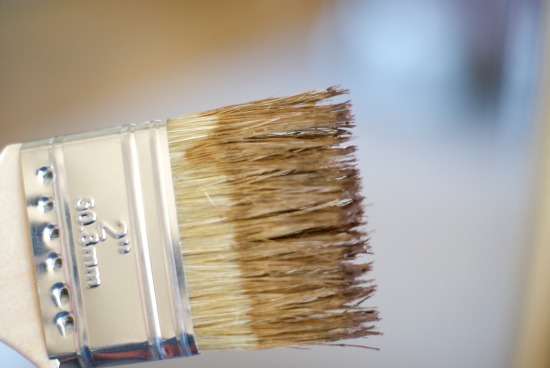 You can always add a little more dark paint, or if you got too much wipe it a little with a damp rag and go back over it with your brush to blend. This isn't a precise process, just play with it until it looks right to you. Close-up you can see the brown a little bit but when you step back it all blends together and looks nice and old. My friend Lisa at Shine Your Light recently wrote a post about making brass look aged. She used a bit of a different method to make her DIY drapery hardware look like brass. 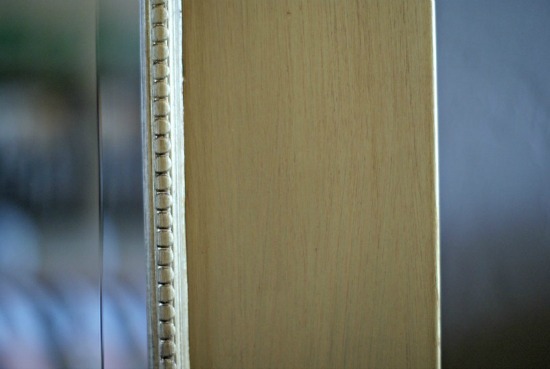 She did a marvelous job, and has some fabulous ideas for creating hardware on the cheap, too. You can read all about it here. How about you? Any other tricks for making new gold look old? 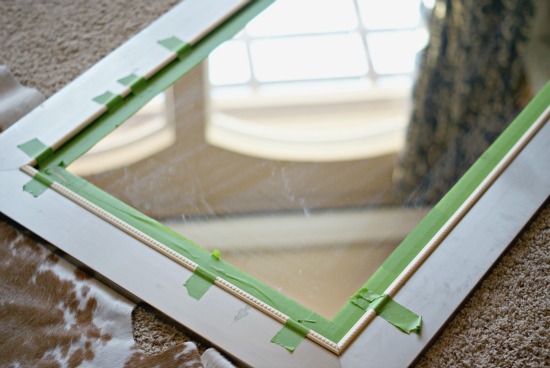 your mirror looks amazing- totally different from where it started! Great job! Thanks for the tip. Looks great Jennifer!! Love the whole corner! Love this idea!! You're so talented! Oh sweet lady - thank you for the mention! 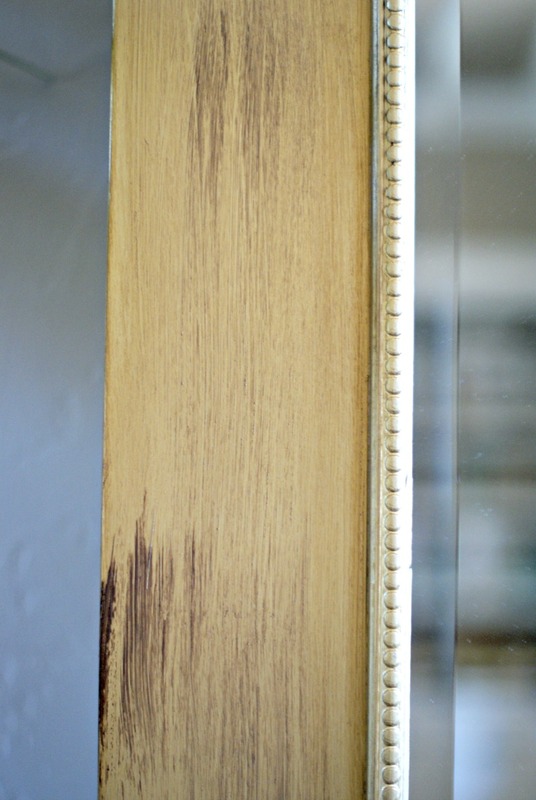 The trim and paint finish totally changed your mirror, I love the technique you used to achieve that softer and more interesting gold. Thank you for sharing, I will try the brush/feathering method next time! That whole wall vignette looks so fabulous!!!! Such a great finish! 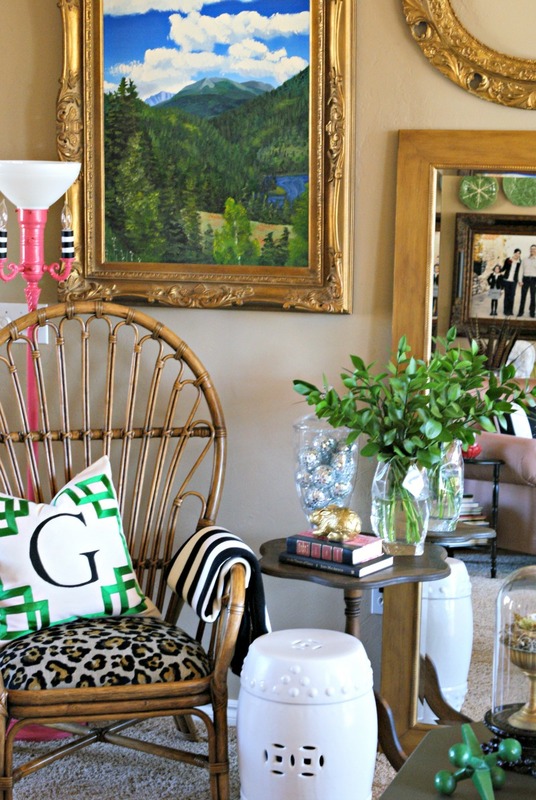 It really blends in so beautifully with the other decor, especially in that corner. I love the extra trim you put on the frame. Good looking mirror after you got done with it. You might want to purchase some Rub & Buff to have on hand for this sort of thing. It comes in the expected gold, silver but also in a deep copper which reads brown. 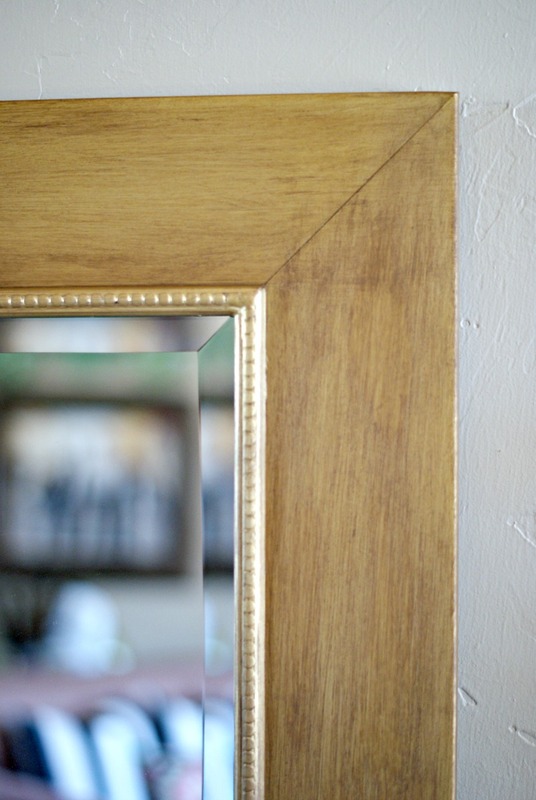 Love the mirror, and the finish looks fantastic! 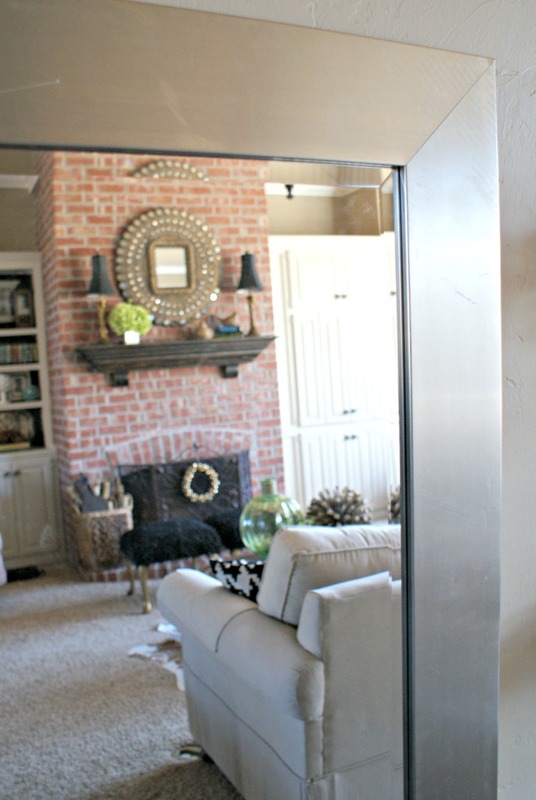 I really need to find a similar mirror for my master bedroom. 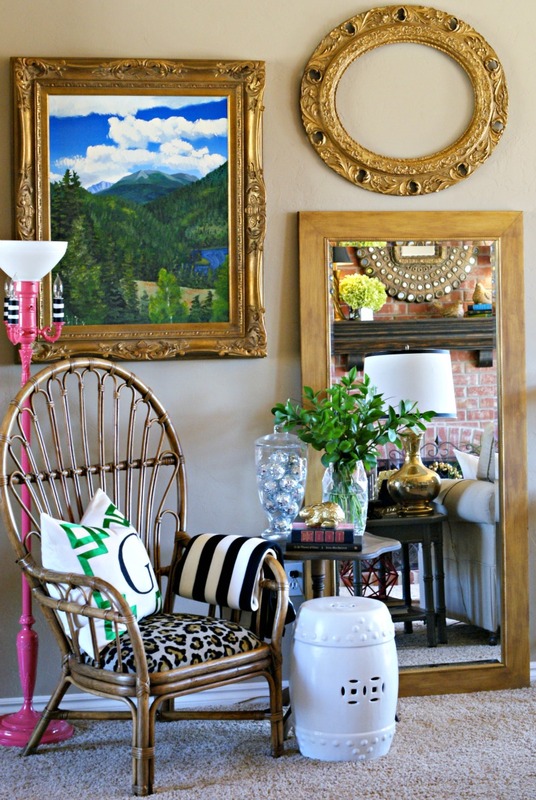 Your wall looks lovely with all the brass frames, you know me, brass is my thing lately. I'm in love with the finish on your mirror. So pretty!